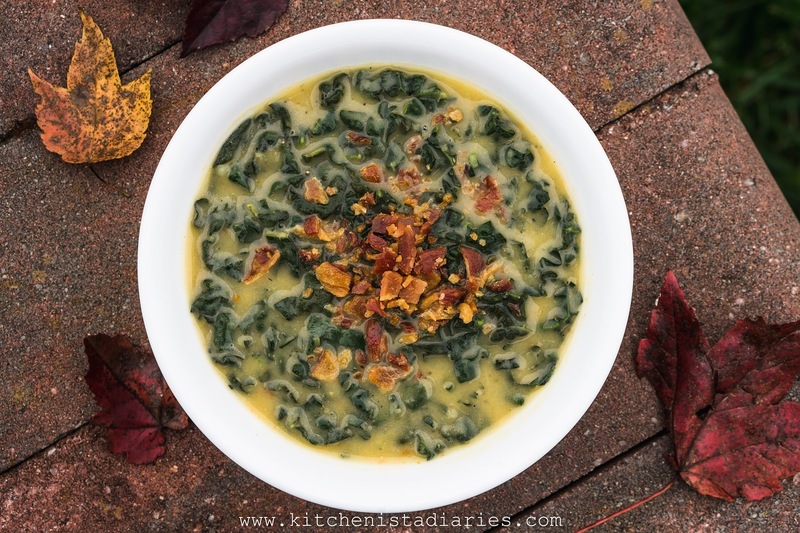 Temperatures are dropping almost as quickly as the leaves here in Virginia, which means it is officially soup season! Although I have a collection of new recipes to try, somehow I end up sticking to a handful of my favorite soups. 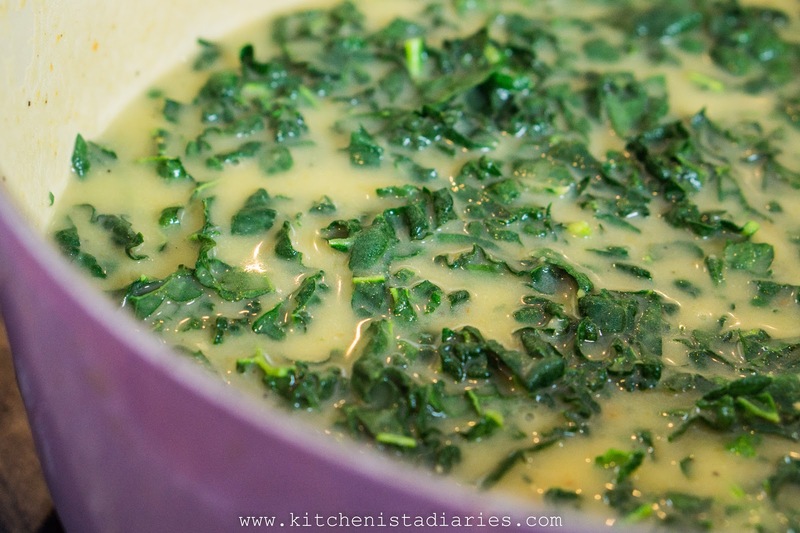 Usually I make some variation of a hearty Portuguese kale soup, a staple for my Cape Verdean family up in New England. I recently shot an episode of "Essence Eats" for Essence Magazine and had the pleasure of making that very soup for the crew. I prepared it similarly to the way I grew up on, garlicky and laced with paprika from the linguica sausage, packed with fresh kale and - my twist - cannelini beans pureed to add body to the broth. The Essence crew loved the soup, and I had an amazing time with them as they shadowed me for the evening in my home. 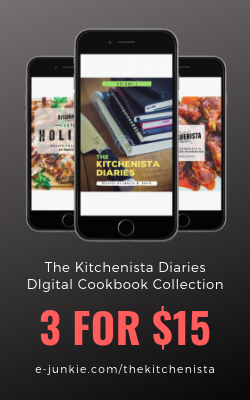 It's going to be a web series about black food professionals, and I'll be featured as a food blogger. I'm really excited (and ridiculously nervous) to see the show premiere, so I'll be keeping you guys posted on any updates! A couple weeks ago, I spent the day at East Lynn farm, not far from where we live in Virginia. To wrap up their CSA program for the season, the farm owners invited customers out to pick their own food from what was left at the farm. It was a dope experience and I'll definitely be blogging about it soon. You can check out more photos of my trip here in the meantime! 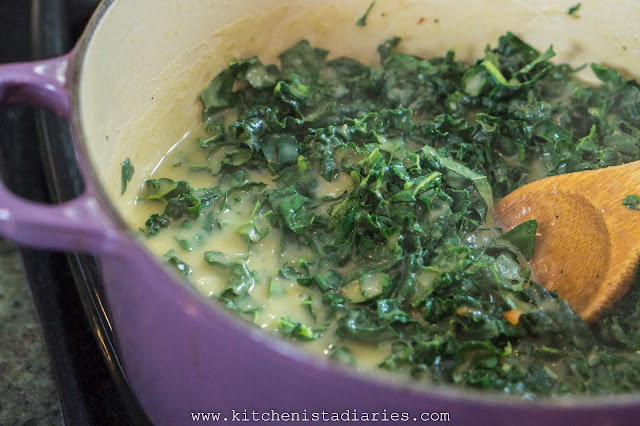 I was blessed with piles upon piles of Tuscan kale from that visit so I decided to make another batch of kale soup. For this version, I used bacon instead of linguica. 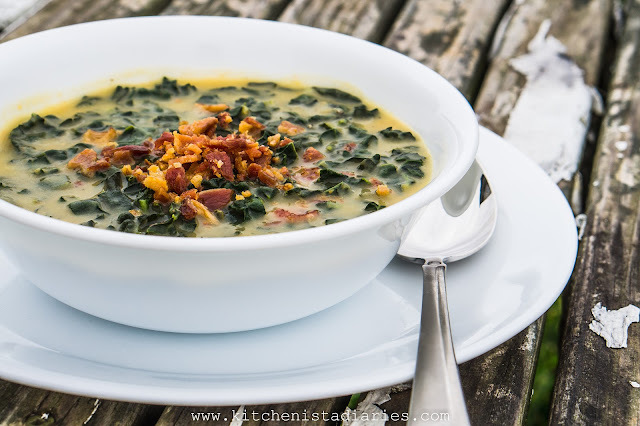 It's a different flavor profile without the paprika from the sausage, but bacon adds a nice smokiness to the soup and is easy to find (linguica tends to be a specialty item only available in certain areas.) 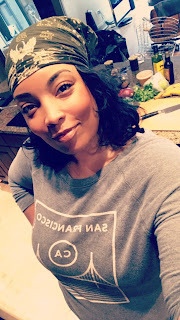 As you may recall, I've completed a couple rounds of the Whole 30 program, which has impacted some of my dietary choices. For that reason I went for the potatoes and skipped the beans in this recipe. 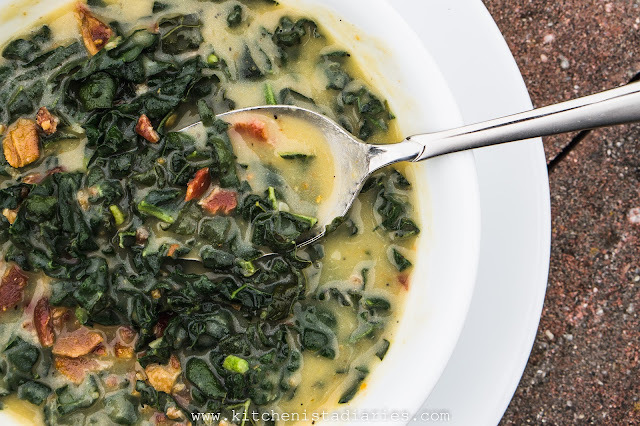 If you're on Whole 30, you'll be happy to know that this soup recipe is compliant as long as you use sugar free bacon, or you can substitute pancetta if that's easier to find without sugar. If you're on a low carb diet plan, you could certainly substitute canned white cannelini beans instead of the potatoes, or even try using cauliflower. 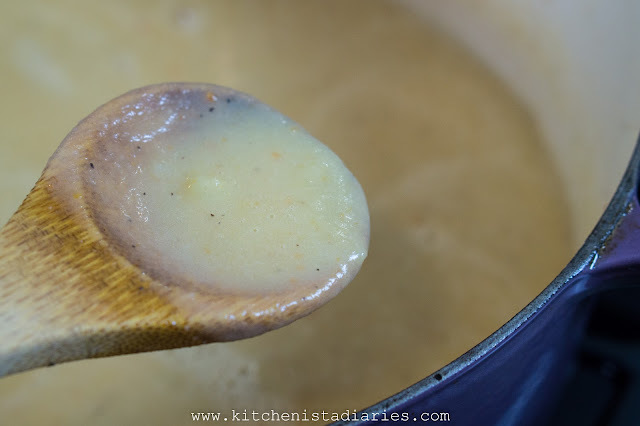 The potatoes are pureed in the soup to give it a creamy texture, so there are plenty of other ingredients that can accomplish a similar mouthfeel. 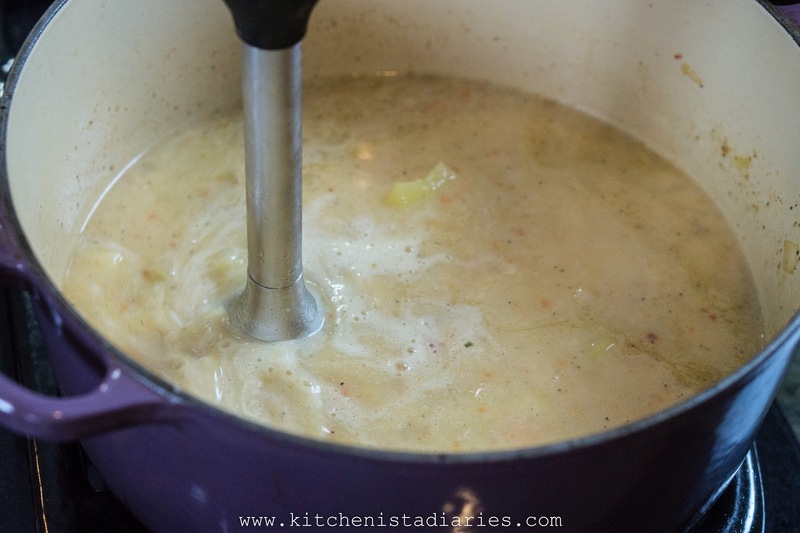 This is a rustic, simple soup with humble ingredients, so the one thing I wouldn't sacrifice is using homemade chicken stock. 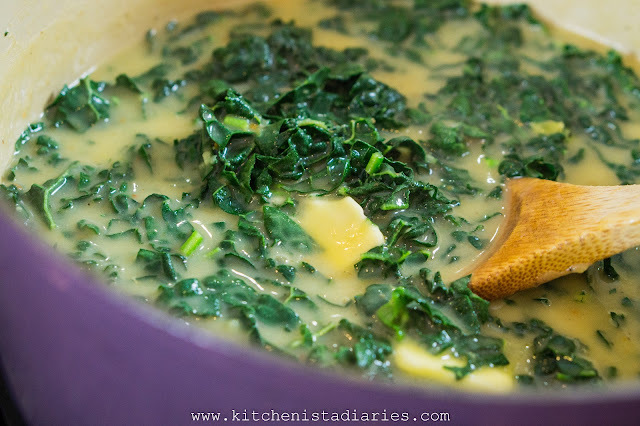 A good stock is the foundation for any great soup! 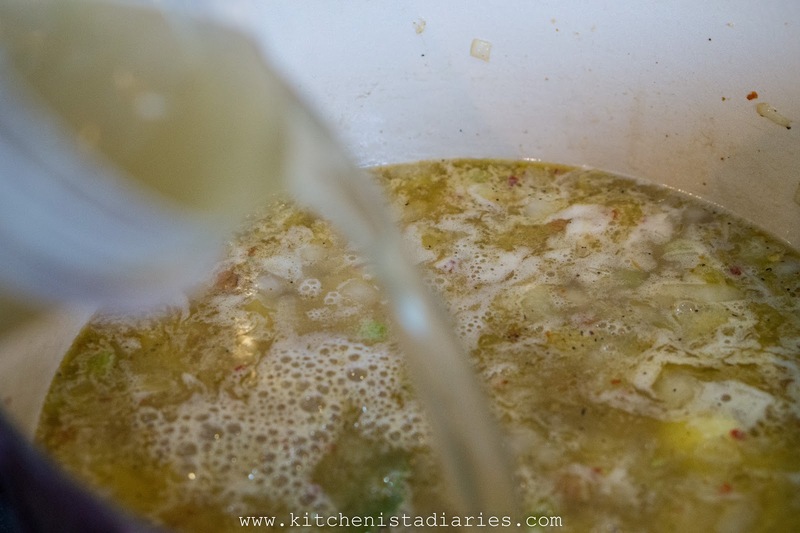 Check out my chicken stock recipe in the previous post if you need some help for that. With Thanksgiving around the corner, it's a great time to have a few quarts on hand! Start out by chopping the bacon into small pieces. Add to the cold pot, turn up the heat to about medium and let it cook until crisp, stirring occasionally. 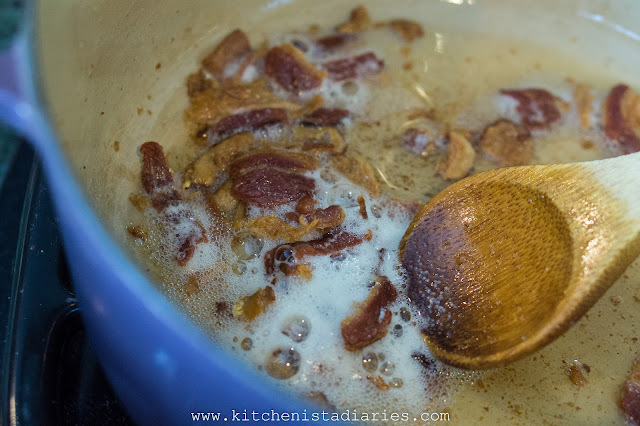 Transfer bacon to a paper towel lined plate and drain off any excess of 2 tablespoons of bacon fat. While the bacon cooks, prep your other ingredients. 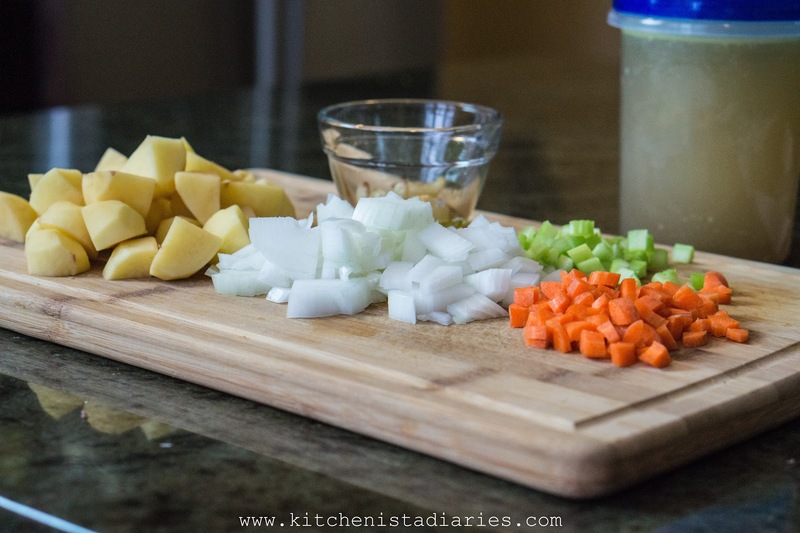 The onions, celery and carrots should be diced. The potatoes should be peeled and diced into 1" pieces. 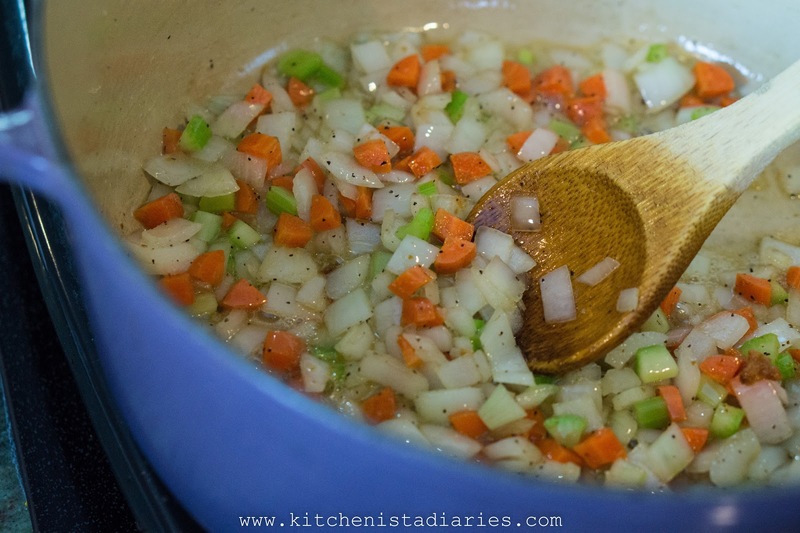 Add the onions, celery and carrots to the bacon fat. You can add olive oil if you didn't have enough fat from cooking the bacon. Season with salt and pepper and cook until the veggies have softened, about 5 minutes. Add the roasted garlic and mash it into the pot. 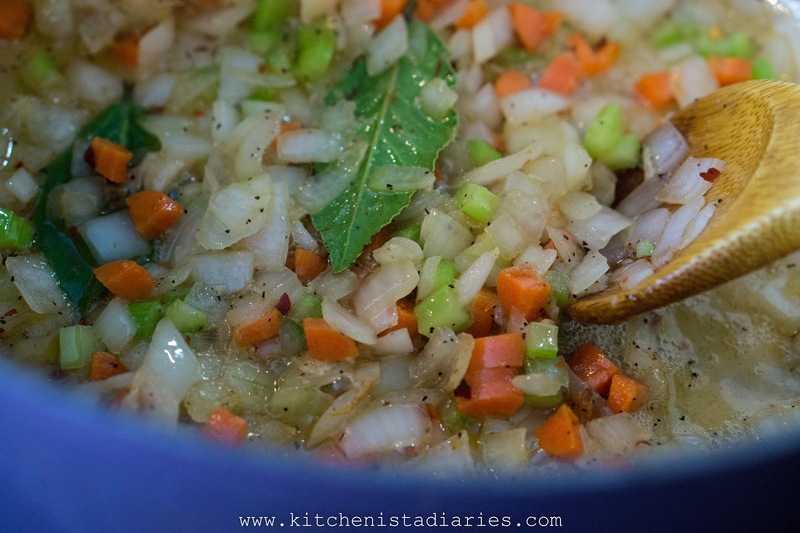 Add the bay leaf and pepper flakes. Cook another minute. Stir in the peeled potatoes. And add the four cups of warmed chicken stock, plus any more needed to cover the potatoes. As I mentioned in the post intro, you could use white beans or cauliflower if you don't want to cook with potatoes. Just adjust the simmering time accordingly. Stir, scraping up any brown bits at the bottom of the pot. Season the broth adequately with salt and pepper. 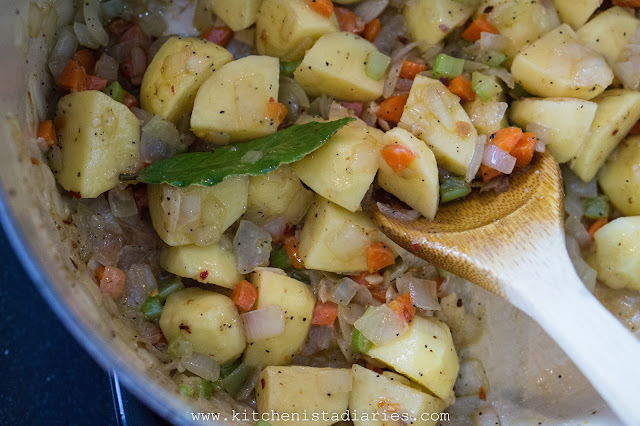 Bring to a boil, then cover the pot and reduce to medium low heat and let the potatoes simmer until cooked, about 20 minutes. Meanwhile, you can prep your kale. 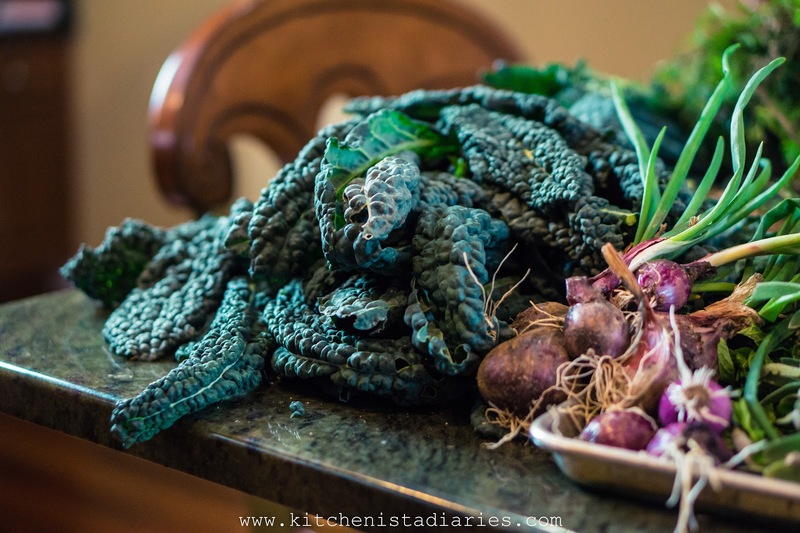 I'd already washed my kale upon getting home from the farm, but even if you buy yours in the store you'll want to give it a good soak in cool water to rinse away any debris. I like working with Tuscan kale because the leaves are tender and don't take long at all to cook. 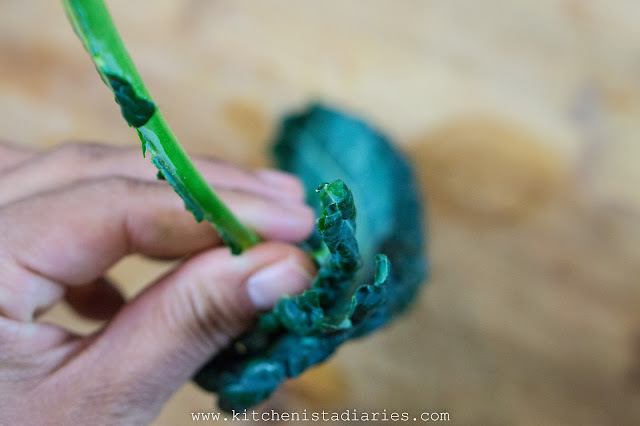 It's easy to strip the leaves by running your thumb and index finger down the stem. Then you can pile up a stack of leaves and slice into thin strips. 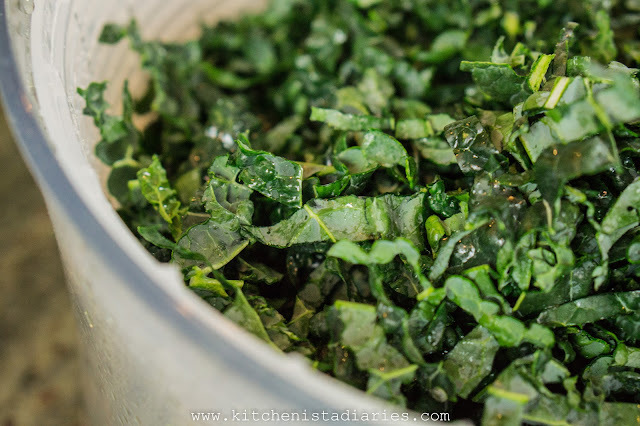 The texture improves the more finely you shred the kale, but do what works for you. It will still be tender if you want to leave it in bigger pieces. Then, to be extra cautious I rinse and drain the shredded leaves once more to make sure I caught everything. This is the same way I clean any kind of hearty greens like kale, collards or chard. So much dirt can get trapped in the crevices! After about twenty minutes, check the potatoes to see if they're cooked through. They need to be easily pierced with a fork once done. Discard the bay leaf. 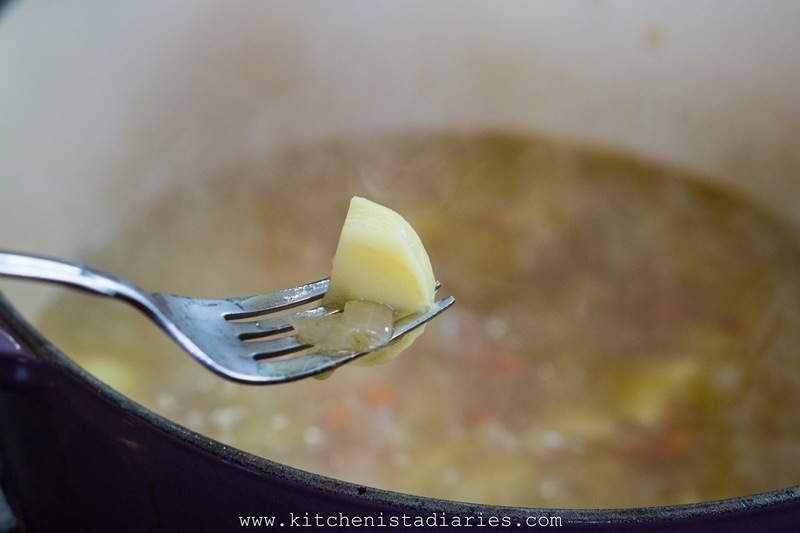 Use an immersion blender to puree the potatoes into the soup broth. If you don't have an immersion blender, you can carefully transfer the soup in batches to an upright blender and puree (be careful not to fill a blender too full with hot liquid as it will overflow!) Otherwise, if you're not too concerned with a smooth texture, you can crush the potatoes in the pot by hand using a potato masher. I left just a tiny bit of texture left in the puree. 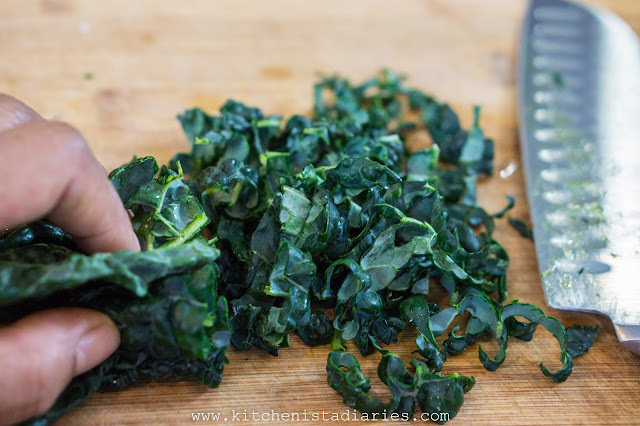 Check the seasoning once again, then add the shredded kale by the handful. It will wilt as it heats, allowing you to add more to the pot. Cook for ten to fifteen minutes or until kale is tender, seasoning with salt if necessary. Finish with a good squeeze of lemon juice and stir in a couple pats of cold butter. If you're making this for Whole 30, you could finish with olive oil or clarified butter instead. The soup is ready to be eaten immediately. As with any other soup, it's also great the next day and freezes well. To serve, ladle into your bowl. 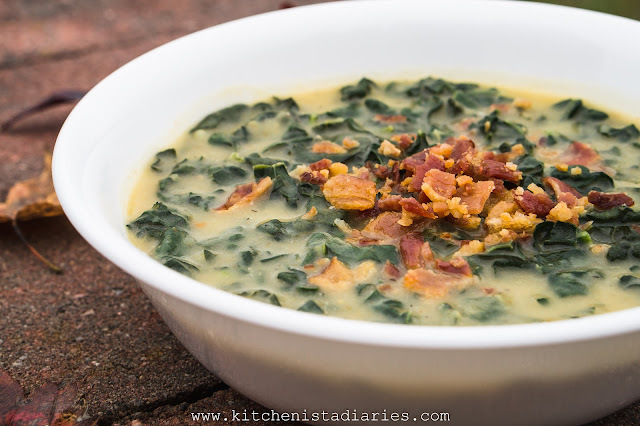 Chop up the cooked bacon and crumble on top of the soup! This was just the bowl of comfort we needed on a brisk fall day. I don't know about you but I'm looking forward to the rest of soup season! Soooo good. It was for meal prep this week and it's gone. Great recipe. Thanks for sharing. Fabulous recipe. Made it with sweet potatoes instead of regular because that was what I had-delicious!